These were the things that prompted me to start looking more closely at the branches, and lead to the discovery of the mummified caterpillars. 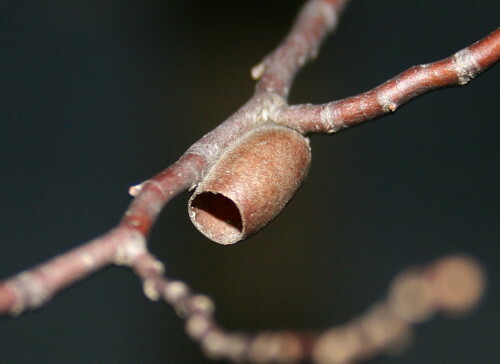 I just noticed the one at first, a little tube tightly affixed to the side of a small twig, right at the crotch of a couple of branches. The closer I looked, the more I spotted. There were nine on the original little sapling, a young hop-hornbeam covered in marscecent leaves, in the understory below the evergreens lining the lake edge. Further up the hill, still in the same little patch, were a few more. And then on my way out, alongside the driveway, I found one more. 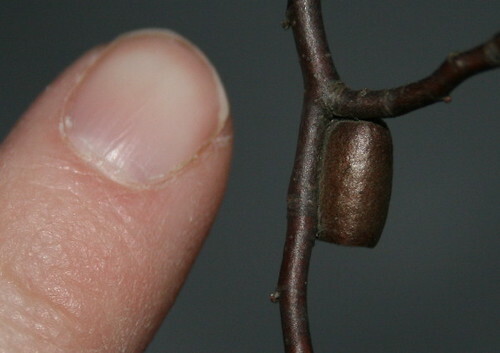 All told there were 13 of these little cocoons. When I got back I posted them to BugGuide.net, because I sure had no idea. It’s such a fabulous resource, that website. Post just about anything and someone will know the answer. I suppose I was expecting the cocoons to be lepidopteran of some sort, but it turned out they belonged to conifer sawflies, members of the order Diprionidae. More specificially, they were probably made by the Introduced Pine Sawfly (Diprion similis). As the very catchy name suggests, this sawfly is non-native, introduced from Europe sometime about 80 years ago, and now targets various pine species in northeastern North America, south to about North Carolina. White Pine is its favourite, and when I reflect on the specific location of the cocoons, the sapling was directly under a towering White Pine. Apparently the species particularly target trees that are exposed, either because they reach above the canopy of the surrounding forest, or because they’re separated from other trees. Like most such pests, minor outbreaks are no serious threat to the tree, but heavy and/or repeated outbreaks, or infestations on weak or diseased trees, do have the potential to kill the branch or even the tree itself. 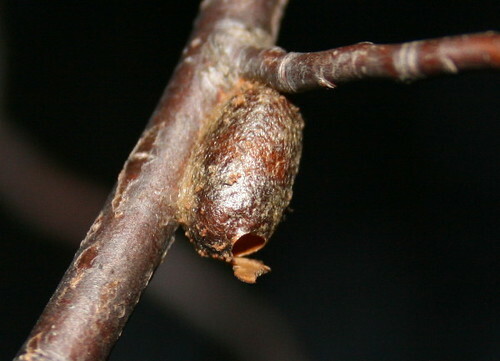 The cocoons above, that look like one end has been sheared off, are typical of successful sawfly cocoons, ones where the larva made it to maturity. I found two that were still closed and looked like the larva didn’t make it. And then I found this one, which, instead of being sawn-off, had a trap-door type of exit. This apparently is evidence that the larva was parasitized by an ichneumonid wasp. The sawfly larva was killed, but the wasp larva made it to adulthood and left. Too cool. Ooooh…very cool, indeed! Great pictures. Great detail in your photos. And a pest we don’t have. Yes, these escape routes both look “right” to my eyes. It’s when I’ve found casings with a hole two-thirds along that I’ve failed to imagine how the inhabitant could have worked its way out. Answer: wrong inhabitant! I just wanted to let you know how helpful this post was. I found the same cocoons around our place recently and didn’t know what they were. Someone identified them for me and then searching through google led me here (where I’ve visited many times already – love the new design by the way, especially the animal tracks background). Thanks again, I always learn something new when I stop by. These are also found in Newfoundland, Canada. I have them on my pine trees. Didn’t know what they were. Sent samples to forestry and they told me what they were. Finding it hard to get rid of them, they come back every year. (I also love the theme/design), I don’t have time to read through it all at the moment but I have saved it and also added your RSS feeds, so when I have time I will be back to read more, Please do keep up the fantastic work.